Anatomy of a fake news story. In a flurry of activity last week, Anthony Scaramucci became the White House communications director while President Trump accepted Sean Spicer’s resignation. In doing so, President Trump gave one of the biggest microphones in the world to someone who believes the Earth is 5,500 years old. Scaramucci, one of many Wall Streeters who now influence the Trump Administration, is known for his business acumen as a salesman. Unfortunately, that does not translate into the realm of science, to which Scaramucci unfoundedly disagrees with basic conclusions of science. In an interview on CNN in 2016 Scaramucci compared the consensus on climate change to the once held belief that the world is flat. 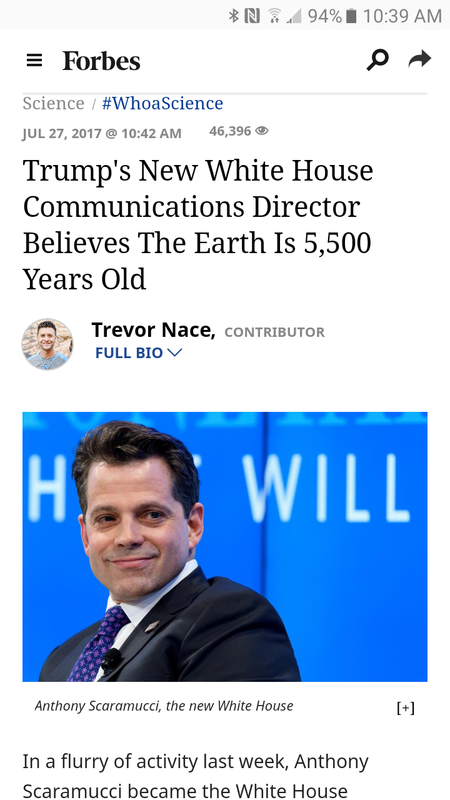 “You’re saying the scientific community knows, and I’m saying people have gotten things wrong throughout the 5,500-year history of our planet,” said Scaramucci in the interview. Scaramucci never said anything about the age of the Earth in the CNN interview. Scaramucci was responding to Chris Cuomo’s repetition of the 97% consensus lie. The CNN interview has nothing at all to do with the age of the Earth. Scaramucci was discussing Trump’s position on climate change. Here we have a young geologist, writing for Forbes, with a Young Earth Creationist obsession, fabricating a story. This errant misquote is now being repeated as fact-based news on multiple Internet outlets… the anatomy of a fake news story.